Oh, but how I admit to being a greedy little thing when it comes to apple pie, always have been. Pushing it to the maximum possible limit on just how many apples I can stuff into that old, dented pie tin lined with crust, or I should say, almost two crusts. Yes, I even make two pie crust recipes for this pie, using about a half of the other. Green, red, crisp, tart, juicy, sweet, I stack em in and stack em high until the big ole mound resembles something like the bulge of a stuffed turkey on Thanksgiving Day. Now this is my idea of a good old fashioned apple pie. Sweet and buttery, this crust is not one that produces the pliability of perfection, even upon careful attention with your best rolling pin. It cooperates just nicely enough to amply cover your tin circumference and then, tiny pieces of remnant dough may be torn off and stuck with your thumb filling any tiny crack or opening, guaranteeing complete collection of all the sweet juices from the sugared apples contained within. And yes, yes, I know, preparing two pie crusts for one pie may seem a bit excessive, and one pie crust will indeed cover this pie, I’ve done it many times. It’s just that the two provide more freedom and, just plain fun for stacking, covering, o.k, playing with the dough like a child, finished by shaping as many of those little leaves as you care to before carefully cutting in the centers with tiny little lines like thin veins streaming to the dark green stems of the bright colored leaves in the fall. 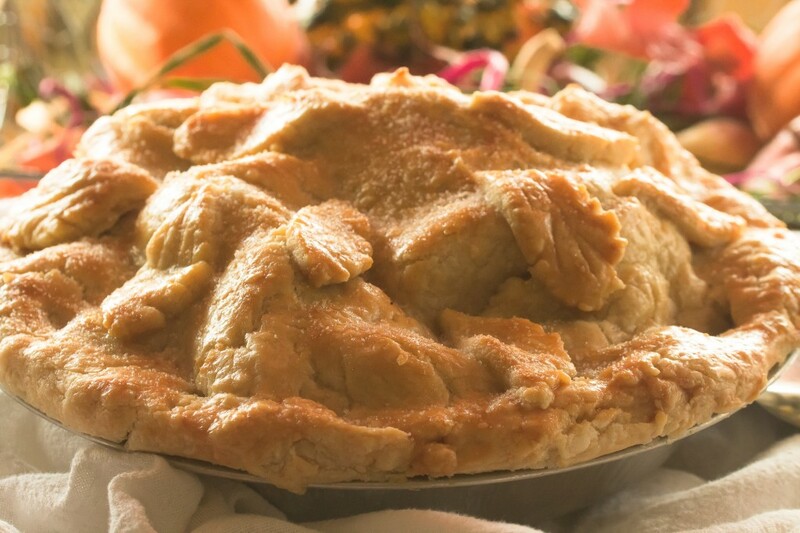 On the other hand, any remaining pie dough may be frozen and used on another occasion, or, like me, you can even let the children or grandchildren get into the fun creating a smaller pie of their own, wrapped all around its filling, apples; green, red, crisp, tart, juicy, sweet, still bulging like a stuffed turkey on Thanksgiving Day. Topped with shaped out versions of leaves, thin lines drawn about like the veins leading to the dark green stems of bright colored leaves in the fall, stack em in, and stack em high and there you have it, the Stacked High Apple Pie. This dough is easy to patch if any cracking occurs during rolling or laying into the pie tin. Simply press a dough scrap into the area needing a little extra dough. Lightly grease pie tin with butter or shortening and a bit of flour rotating tin to cover the bottom and sides before shaking out excess flour. Into the bowl of a food processor, wiz together the flour, salt, sugar, chilled butter bits and shortening, pulsing the mixture to a coarse meal. Dribble in the ice water one tablespoon at a time until the dough holds together in a ball. Shape the dough into a disk, cut in half and re-shape each half into a round. Wrap both rounds in plastic wrap, chill for a half hour. 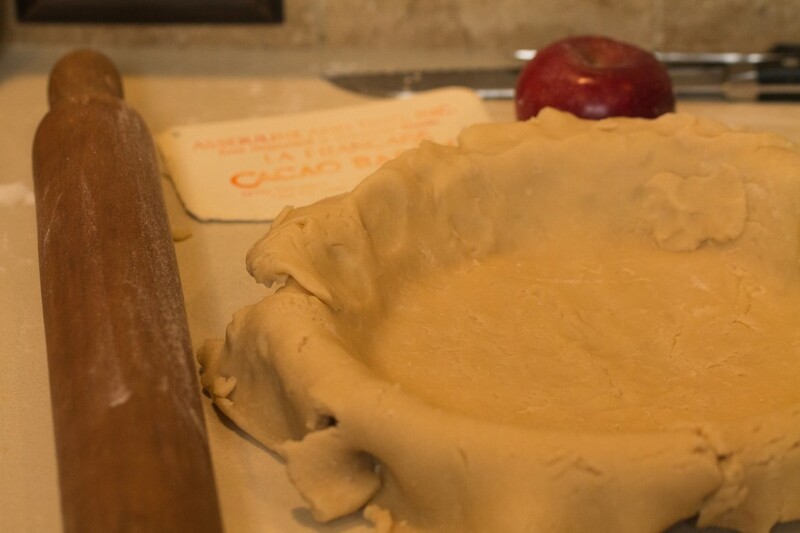 One round at a time on a lightly floured surface, roll out dough rounds large enough to cover pie tin bottom leaving some excess to pinch the edges with the top dough once filled with apples. Using a sharp knife, draw and cut out leaf like shapes using dough scraps. Preheat oven to 350 degrees. 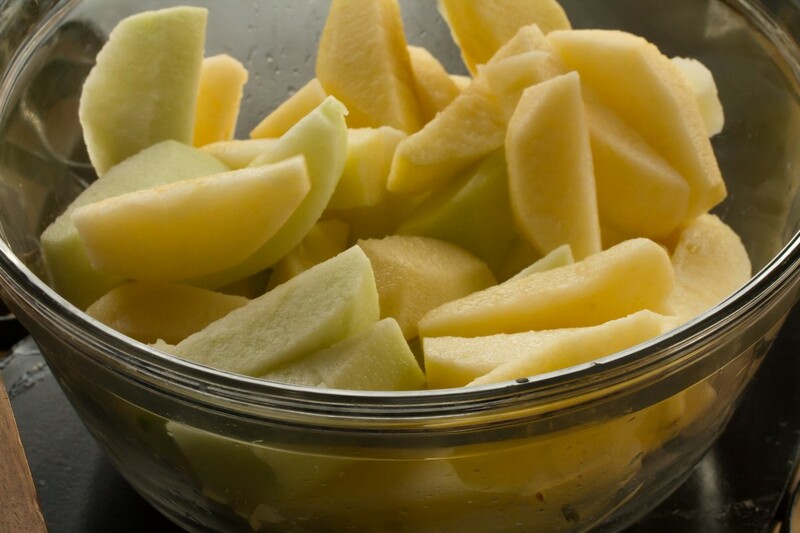 Place sliced apples into a large glass bowl, stir through one tablespoon lemon juice and the lemon rind. Toss in the sugar, flour, cinnamon, nutmeg salt, and vanilla, stir throughout. Pour apple mixture into the pan tin lined with the dough, dot butter evenly all around. 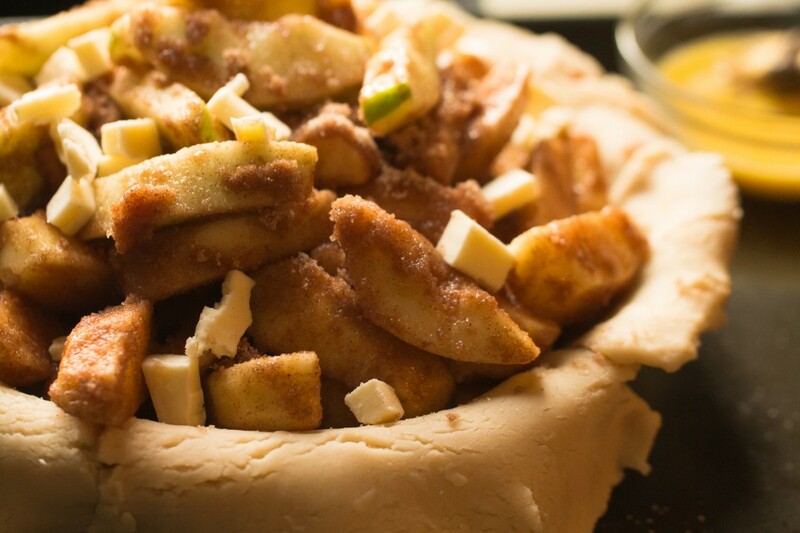 Loosely lay the top crust over the stacked apples pinching the top and bottom crusts together all around. Brush dough with the egg wash. Working quickly, brush egg wash onto the back of the shaped leaves and place decoratively around the top. 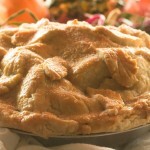 With a sharp knife, make a few small slits into the top of the pie. Place pie onto a cookie sheet and put into oven. Bake for forty five minutes, take apple pie out of the oven, brush again with egg wash then sprinkle about with some sugar. Put pie back into the oven and cook another ten minutes or more until crust is golden brown all over. If not using dough after one-half hour of chilling, let sit at room temperature for fifteen minutes or a little longer for easier rolling. Dough may be frozen, defrosted overnight in the refrigerator, then set on a counter for fifteen minutes or more before rolling out. This entry was posted in Fruit, Sweet Treats and tagged Apple Pie, Stacked High Apple Pie. Bookmark the permalink. Post a comment or leave a trackback: Trackback URL. 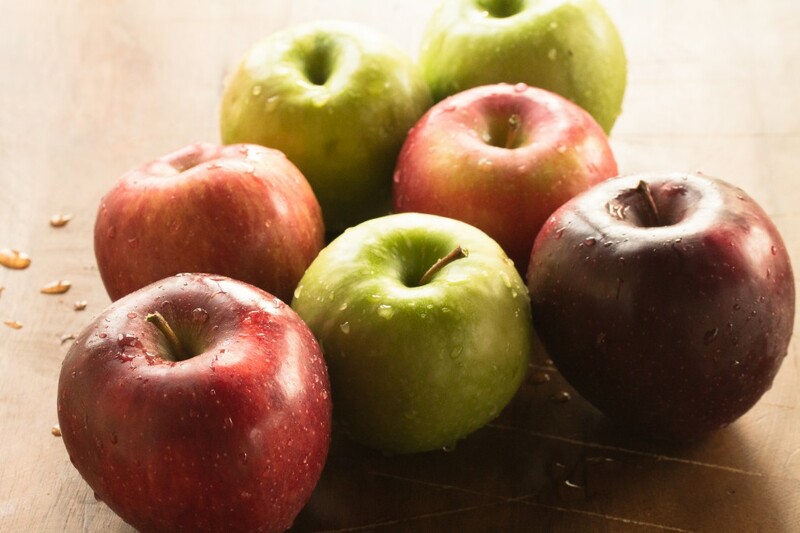 Dear Peggy, now there is a beautiful Apple Pie, just like the ones i love, with different varieties of apples – whenever I bake certain apple cakes and pies, I often mention that it is best to use different kinds of apples – an assortment of fruits always seems to make the most delicious of baked goods. And I just love the way your lovely pie looks like, all big and chock -ull of fruit – you could not have put it better “bulging like a stuffed turkey” – now if only I lived a little closer…I certainly would not mind a big fat slice with my afternoon cup of tea! I will thinking about that pie of yours today! Dear Andrea, thanks so much, and I do so wish you lived a bit nearer that we might share a slice of this pie together, along with a cup of tea. Agreed, on using a variety of fruits in the preparation of baked goods providing added dimensions between flavors. Thanks so much for joining in, talk to you soon! This looks like a prize winner, Peggy! My Nana was a great pie maker. Sadly, her eyesight became quite poor, due to macular degeneration. In one of her last pies, she accidentally subbed cayenne pepper for cinnamon. Imagine the shock we all had. At first, she was devastated, but later, we all had a good laugh. Thank you for this recipe. Perhaps I will make one in honor of my Nana. Hugs from Massachusetts. Hello Kelly, thanks so much! I love this apple pie and the annual tradition on preparing it, including the little decorative leaves on the top. Thank you SO much for sharing the great story on your Nana, such a good one and I’m happy that all could enjoy a good laugh, including Nana. Hope you enjoy the pie if you prepare it! Hi Peggy, such a beautiful pie with all the varieties of apples stacked mile high, I bet your home smelled wonderful, love your little leaves. Hi Cheri, thanks so much. 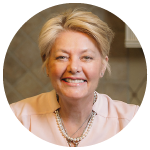 I have been loving your food preparations and your beautiful shots of Arizona scenery that always bring me fond memories of days past! And yes, making those little leaves is half of the fun in preparing this pie, and nice annual tradition. Thanks so much for joining in!